Let’s get the families together for dinner,” Dave suggested. “I’ll order a qua-duc-ant!” We’d been sipping wine, so I thought maybe Dave was slurring. I thought he was trying to say “decanter.” Nope. He meant qua-duc-ant. When I told City Weekly managing editor Jerre Wroble about the qua-duc-ant—which is somewhat akin to a turducken—she got a little grossed out over this unholy union of pheasant (large bird in the order Galliformes), quail (midsized bird in the pheasant family Phasiandae) and duck (water fowl in the Anatidae family). Oh yeah, and then there’s the pig. 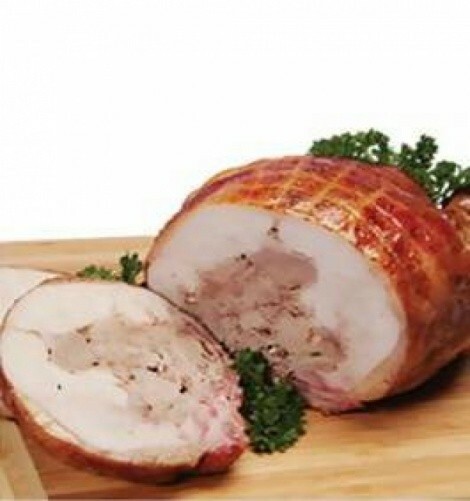 A qua-duc-ant (available from CajunGrocer.com) is breast meat of a quail stuffed with breast meat from a duck, stuffed into a deboned pheasant, then stuffed in the middle with Creole sausage. It’s exactly as delicious as it sounds. The challenge was to find wine to drink with our qua-duc-ant. And I do mean challenge. The triple-play trio of bird meats ranging from light to dark, along with spicy, fatty Creole pork sausage, made for a humdinger of a wine-pairing experiment. So we avoided the issue—or at least, postponed it—by kicking things off with Chimay Red Trappist Ale ($9) from Belgium. This unpasteurized, top-fermented ale has fruity apricot and vanilla aromas, a creamy head and silky softness on the tongue. If beer can be elegant and beautiful, this one is. Riesling goes with everything, right? So we uncorked a bottle of J.J. Prum Graacher Kabinett Himmelreich Riesling 2007 ($34.50), from the Mosel. It’s been a while since I’ve tasted a Riesling that rocked like this one. It’s earthy with loads of minerality (geology in a bottle), but delicate and light with juicy pear and pineapple notes. I’d drink this with anything from choucroute garni to, well, qua-duc-ant. Next up: Cakebread Cellars Chardonnay, Napa 2007 ($41). Buttery and creamy with toasted oak, Cakebread makes a well-balanced Chard bursting with white peach, apple and lemony flavors along with a mineral backbone—a lovely, harmonious wine. One benefit of serving something like a qua-duc-ant, with its mélange of dark and light flavors, is that so many different wines and wine styles are grist for the wine-pairing mill. So I was intrigued by what French Burgundy might have to offer, especially since red Burgundy and duck is, for me, a food-and-wine match made in heaven. Les Boudots borders the Premier Cru vineyards of Vosne Romanée, which produces some of the world’s best Burgundies. So with Louis Jadot Nuits-Saint-Georges Les Boudots 2005 ($88.50) you get a world-class wine at a fraction of what, for example, a DRC Romanée-Conti would cost. I think this wine could use some more time in the bottle to mellow it out a bit. But even now it’s a characteristically full-bodied, firm, rich wine with great depth that should get better and better over the next decade. And yes, Nuits-Saint-Georges hit the quaduc-ant’s sweet spot. I had my doubts about drinking Syrah with the qua-duc-ant, thinking it would overpower the bird(s). But Dave found a gorgeous fruit bomb in the 2005 Dumol “Eddie’s Patch” Sonoma Russian River Valley Syrah ($92.25). Parker called this a “fabulous Syrah” and he wasn’t whistling Dixie, it’s absolutely riveting. Complex and intense, bursting with blackberry and currant flavors, I don’t know that I’ve ever had Syrah this well-balanced. Fabulous. So how do you follow that? With the dazzling 1998 Joseph Phelps Insignia ($140), a graceful blend of Cabernet and Merlot that’s fat, succulent and stunningly symmetrical. Did it complement the qua-ducant? Who cares, with a wine this marvelous? We finished off with Far Niente Dolce 1997 ($70). Mission accomplished.